How are you when it comes to safe online shopping tips? What will you feel when you buy something on the internet, only to find out after forking over your hard earned money, that the whole thing is a scam? I know I’d be steamed! It’s highly likely that some of you listening to this podcast on safe online shopping tips, in spite of your best efforts, have been scammed when making purchases through the Internet. I know I was scammed when buying a ticket to the Super Bowl in 2011. Fortunately for me, I had precautions in place and other than the headache of the situation, ended up doing well. Unfortunately, though, I am the exception to the rule, and many people are taken advantage of through online scams. So, I’m going to use this episode to talk with you about strategies and tactics we all can use when to keep ourselves safe when making a purchase through the internet. Making the seller of an item prove they are legitimate isn’t foolproof. However, it can help chase off some scammers, while providing you with information that will help with your decision to buy. I didn’t come up with this on my own. Instead, I saw it discussed in a Facebook group after a member had someone try to sell him an expensive knife. So, just to bring you into the fold of what happened, here it is. The buyer is in a Facebook group where people trade and sell things. Well, in this case, the buyer was interested in a great, but pricey knife. Luckily for him, there was a dude in the Facebook group selling one he liked. So, the buyer and seller/scammer went back and forth about the knife. Eventually, they decided to make the deal. However, before doing so, the buyer came up with a great idea. I don’t know whether it was his idea, or someone else’s, but it is an excellent idea regardless. The great idea that I’m talking about is this. The buyer asked the seller to send him a picture, holding the knife, while also making a “V” for victory sign with his fingers. Well, maybe he’s more of a hippy and was asking him to make a peace sign. Anyhow, the scammer sent a pic, or video, I can’t remember which, that showed a guy holding the knife, but NOT making the hand gesture as requested by the buyer. Instead, he tried to play it off, but our intelligent, on the prowl buyer, did a little research and was able to find the same picture/video on a knife dealers website. The only problem is that the dude in the picture on the site is the same dude in the photo that was sent to the buyer as his proof that it is a real deal. Well, when the buyer confronted Mr. Jackwagon about the photo he sent being one pulled off a knife dealers site, the scammer’s hopes went up in smoke. So, the moral of this story is this. Don’t take things for granted. Be cautious when purchasing stuff off the internet. When you do, use your head to think outside of the box when coming up with ways to throw a monkey wrench into scammers plans. Make sure you research the person or company you are considering making a purchase from. Scammers usually don’t include their personal information, such as a phone number, street address, or email address. After all, it makes it easier to find if they do. Therefore, when working with a person or company that you aren’t familiar with, check them out. If you do get any contact info, look it up on the computer. When you do, if you notice anything that looks suspicious, or gets your spidey sense pinging, consider finding another dealer to make your purchase through. 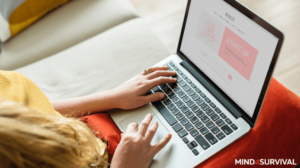 One of the best safe online shopping tips and ways to keep yourself from becoming the victim of a scam is to stay informed about the types of scams that are out there. The fact is, scammers are continually thinking of ways to part you from your money. Because of that, they’re likely to target people who may not have a clue about the latest and greatest tactics that our scamming scumbag learned during his last visit to jail. You can pick up on the latest and greatest in scams and safe online shopping tips through local media, or watching the news. It’s good to remember that scammers don’t care about the situation you’re in. Actually, they hope you’re stressed and looking for a magic bullet, that they can use to scam you with. So, if you’re hit with a disaster, be extra cautious, because scammers will use an accident and peoples need for help to worm their way in and steal you blind. Sure, most of us are price driven. However, don’t let your drive for a lower price, also lower your IQ when it comes to how you make a purchase. So, stick with reputable and established businesses that have a solid track record of delivering on their promise. Look at it this way. When you’re surfing and buying online, act like you’re shopping in person. In other words, would you go to a shady side of town to buy something out of the trunk of a car in an alley? I doubt most of you would. Instead, you’ll probably go to a local mall or another store with lots of foot traffic and a good reputation. Again, treat your online buying like a purchase made in person. Stick with what you know and only gingerly expand and test other sources when the time is right, and the downside of a loss won’t crush you. Well, there’s a fifth tip for you. Watch out who and who you pay for things you buy online. If you have any other thoughts or questions about your Safe Online Shopping Tips, please leave a comment below. Thanks for reading to this post about safe online shopping tips?